I’m excited you found us! Are you passionate about supporting the growth of female entrepreneurship? Are you a natural leader and connector? If so, I want to meet you! Please take a moment to fill out the form below. This unique coworking platform is changing the way women work together and, in turn, women are changing the way business is done! Hera Hub is expanding nationally and internationally through a licensing model. This allows accomplished professionals to use the brand and system, while bringing their unique talents to the community. Looking forward to seeing if our goals align! After running a marketing strategy business out of her home for eight years, Hera Hub founder Felena Hanson knew she had to find a cost-effective/flexible place where she could escape the isolation and daily distractions. She was excited to stumble on the concept of coworking and shared office space but found most of the existing spaces were designed other audiences. Given she was dedicated to serving entrepreneurial women, through leadership in organizations like Ladies Who Launch, she began exploring what it would take to start a shared work space focused on serving women owned businesses. After much research, she came up with the idea of building a work and meeting space where enterprising women could connect and collaborate in a spa-inspired setting. She launched the first Hera Hub in August 2011 and has been growing by leaps and bounds ever since! Hear what our members have to say about the Hera Hub community. Support however I can. I love the concept! Are passionate about entrepreneurship, creating business opportunities for women and have confidence that women-owned businesses are the key to the next wave of U.S. prosperity. Are committed to building community and believe that a strong group of supportive women are vital to creating business success. Are fanatical about creating the perfect atmosphere, as we feel a beautiful workspace makes you more focused and productive. Value flexibility and believe that you should have options to work from home as well have access to professional space on an as-needed basis. Are dedicated to fostering a collaborative environment where we curate introductions and offer events that connect like-minded members. Are passionate about education and self-development and believe that life-long learning is imperative. Feel success breeds success and that sharing accomplishments inspires others to reach new heights. 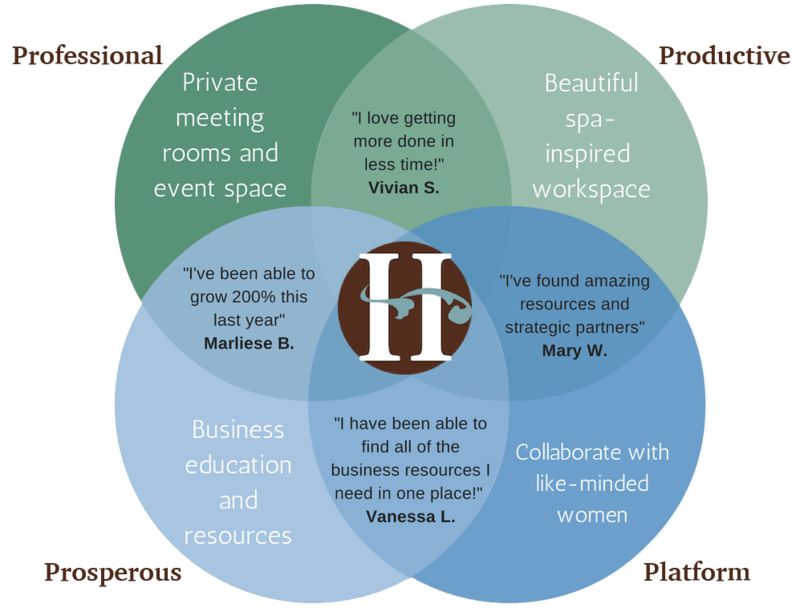 To provide entrepreneurial women with a productive, professional work and meeting space, where they can connect with a like-minded community to collaborate and flourish. Our goal is to support over 20,000 women in the launch and growth of their business by 2020. Why choose this business model? Currently 30% of U.S. knowledge-based workers are independent (freelancers, consultants, entrepreneurs). This figure is projected to reach close to 50% by 2020. Learn more: MBO partners Independent Workforce report. Most of these independents work (and will continue to work) from home. While this can be cost effective and convenient, many experience isolation and report difficulty focusing due to many distractions. The coworking business model was conceived to fill gaps between the various options available to independent workers. Shared work space provides these individuals with a professional presence, sense of community, and productive work space. 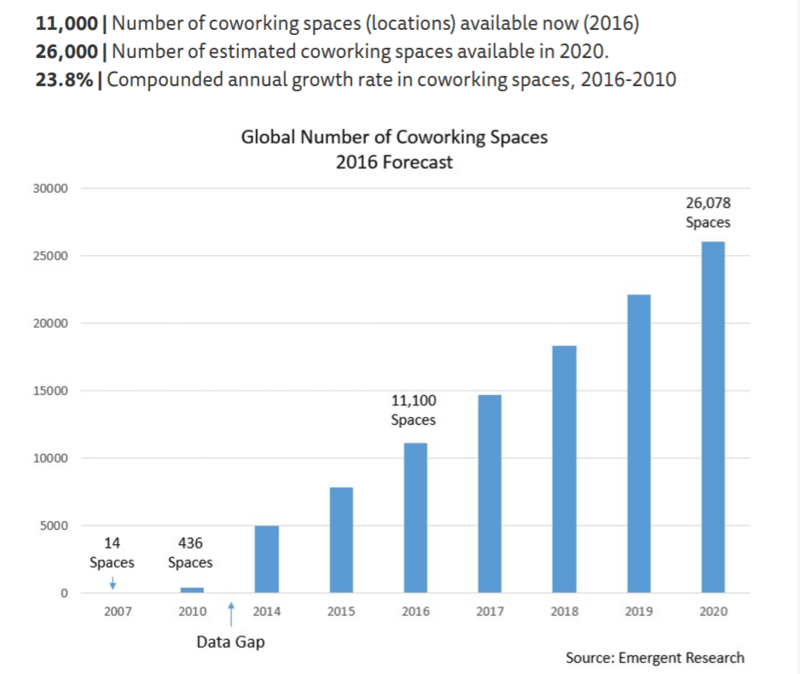 Coworking attracts those who are looking for connection. It’s an automatic network of like-minded entrepreneurs who can learn from one another and find new collaboration opportunities. Shared office space, along with the trend shared economy, are not a trend, but rather the new reality. WHY WOMEN ENTREPRENEURS AND WHY HERA HUB? Women empowering women is more than just a theory. In a Kaufman Foundation study (“Are Successful Women Entrepreneurs Different from Men?” May 2010), women rated their professional and business networks as important contributors to success more highly than men did. It was also found that women entrepreneurs especially benefit from other types of social support and encouragement beyond business. Several of the identified gender differences in the study indicate that support and encouragement from key people can especially benefit women in their efforts to found successful companies. Many women feel more comfortable in an all-woman environment and typically get to a point of trust much quicker, especially in a safe, supportive environment. Do you love bring people together? Do you find fulfillment in seeing your connections turn into much, much more? Are you dedicated to making a difference in your community? Hera Hub is committed to empowering female entrepreneurs and creating investment opportunities for business connectors. Hera Hub is becoming a driving force in the female entrepreneurial movement. Creating an Hera Hub and joining our diverse family will inspire, connect, and enable your community to develop their best work every step of the way. Click the video below to learn more about the Hera Hub Collective – our unique licensing model. Women empowering women is more than just a theory. In a Kaufman Foundation study (“Are Successful Women Entrepreneurs Different from Men?” May 2010), women rated their professional and business networks as important contributors to success more highly than men did. It was also found that women especially benefit from other types of social support and encouragement beyond business. Several of the identified gender differences in the study indicate that support and encouragement from key people can especially benefit women in their efforts to found successful companies. Many women feel more comfortable in a female-focused environment and typically get to a point of trust much quicker, especially in a safe, supportive environment like Hera Hub. Hear directly from our licensees about their experience. Julia Westfall is the founder of Hera Hub DC and Sophia Renemar is the founder of Hera Hub Sweden. Opening a brick and mortar business is a major life decision. According to the Small Business Administration 50% of all businesses fail in the first year and close to 80% fail in the first five years. While there are no guarantees, investing in a vetted business model will give you a significant jump start on the market and ensure you don’t make the same costly mistakes that others have made before you. It also gives you a trusted business partner that is there for you every step of the way. Also, it’s a heck of a lot more fun to work with and collaborate with other passionate entrepreneurs than being left alone to “figure it out” yourself!